Happy Easter everyone! Well, it’s been a pretty good sofar. I’ve eaten jelly beans, Easter Ham, and enjoyed the snow. Yeah, it’s snowing outside here in St. Louis. 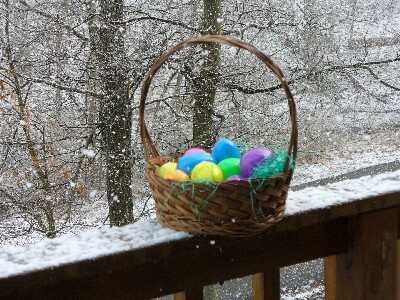 When I was a kid, I always remember Easter being really warm outside. It’s usually about 80 degrees outside & everyone is in shorts. Well, 3 days ago it was 70 outside. Today it’s snowing. My nephew got a Cars (the pixar movie) fishing pole, a magnet doodle, some little matchbox planes, a horton heres a who stuffed animal, along with a bunch of candy. I don’t remember ever getting that much for Easter. I’d usually get candy, & a small toy, silly putty or sidewalk chalk. If I think back, there aren’t many real memorable easters. 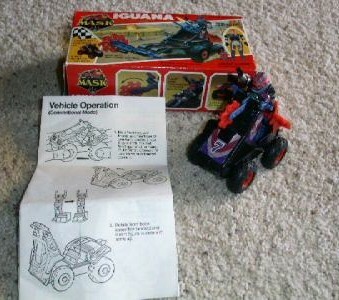 But, I do remember one year sitting next to my easter basket was the M.A.S.K. vehicle, Iguana. Its basically a guy with a mask on an ATV that changes into a fold-up ATV with some guns. It was always one of my favorite vehicles, because it was perfect for playing “off-road” in the sandbox.